There’s no getting around it. Dubai is HOT HOT HOT! Usually, the temperatures increase from April to September (ish), although you might have noticed it has started to get a bit toasty now, and it is only mid-March! All those dogs that decided it would be a good idea to spring a winter coat at the beginning of January might just be a bit on the warm side now… and I have one of those dogs. Roxy flew in from the UK in November whilst it was still around 35°C in the middle of the day. The day she left the UK there was ice on the ground. Quite the body shock arriving off the plane! However, despite this and the cooler temperatures of December/January, she has begun to acclimatise better than me. Saying that I’ve bought several items that will help her keep cool in the summer, and found some tasty cooling treat recipes that I’d like to share with you. We haven’t used this yet (I’m saving it for when it gets really really hot!). 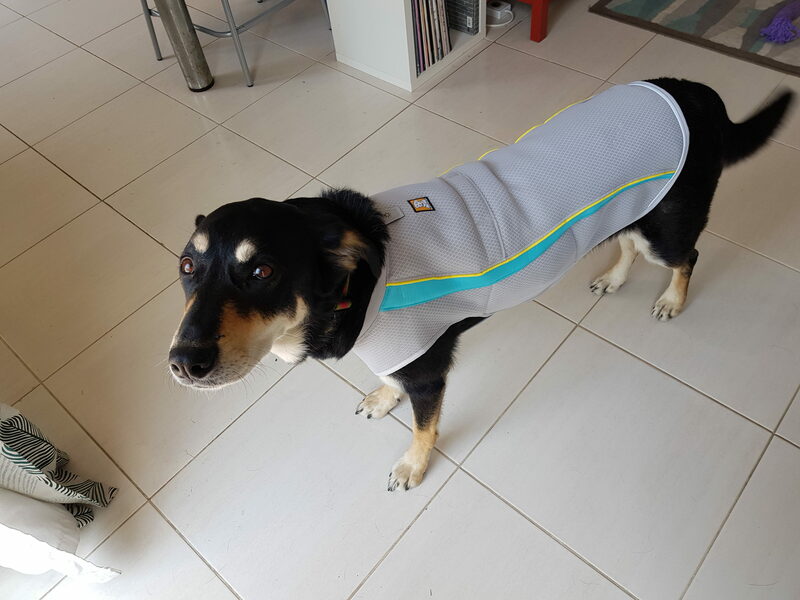 Basically, it’s a jacket you soak with water to help reduce the internal temperature of the dog. It’s also a light colour to reflect the sun, rather than absorb it. Roxy is black, so she heats up super quick in any kind of direct sun. Custard is yellow, so she doesn’t get so hot (plus she has the added bonus of being born in Dubai.) Roxy has a double coat which is slightly thicker than normal (but not as thick as a husky!) so I’m hoping this is going to be a winner, it’s got some great reviews. You can find it sold in Dubai Pet Food & Pet’s Delight. 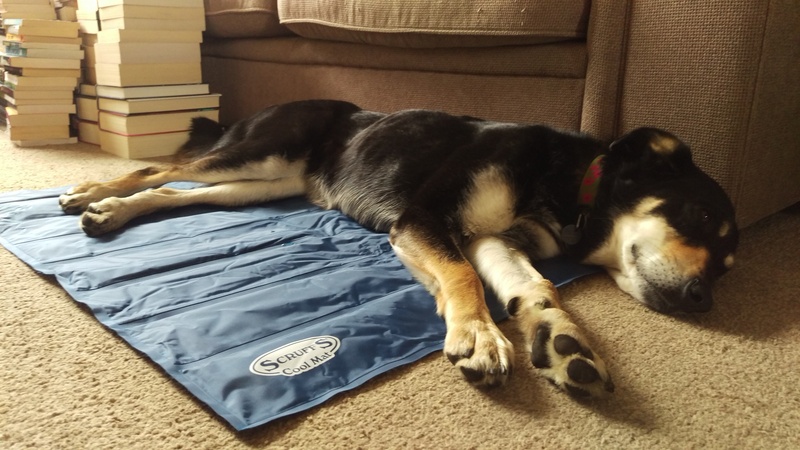 There are loads of cooling mats on the market – I chose this Scruffs one for the reviews, the size and the robustness of it (it’s got to be said I’ve found this rather pleasant to lie on during a hot day!). I made my own cover for it to prevent any claws bursting the gel (even though it is robust, it wasn’t the cheapest so if I can keep it alive for longer, I’ll take it!). It was very simple to make a cover for – I just folded an inside-out piece of fabric in half with the mat inside, pinned it, then sewed (I used a machine, but you can do it by hand). It also means I can wash the cover, keeping the mat clean. Most of the pet shops in Dubai stock versions of this mat. You can even use a towel soaked in cold water on a tiled surface (if they’ll lay on it!). I love Ruffwear. It’s no lie, it’s pricey, but it lasts. I was pretty lucky to pick these up in the returns section of Amazon UK’s website. It’s the secret place items go when they’ve been bought and returned then must be sold at a reduced price. Fortunately, there was nothing wrong with either pair! All I can say is MEASURE YOUR DOG’S FEET. And then measure them again, and a third time. Because I thought I’d got it wrong and got super stressed. Luckily, I’d ordered two different sizes, and the ones I thought I’d ordered for her back feet fit her front and vice versa. PHEW! I bought these because Roxy doesn’t like going to the toilet in the garden, and there’s no way she can hold it from early morning to late evening when it’s cooler to go out for a walk! Therefore, these boots allow us to meander over to the grass by the lake for a quick pee-stop and back. I’ve seen these in Dubai based pet shops, and other brands too. I don’t have any of these, and I’m not sure I will actually get around to purchasing any – other than for keeping sand out of their eyes. There’s not much proof that dogs suffer the same UV damage to their eyes as us and it’s another thing to get them used to/carry around. They look damn cool though! As they spend most of their time looking at the ground for sniffs rather than the sky, I’m not too worried. If anyone has any and has used them, I’d love to know what you think. Carry water with you on walks. You can use it to cool your dog down as you go (and top up a swamp cooler!) and as a drink for both of you. I’m aiming to buy a running belt before the summer hits (not for running!). I like the look of this AONIJIE one– there are two water bottles, space for a phone/keys/treats etc. Plus, it’s a lot cheaper than some I’ve seen. It’s also more lightweight than carrying a rucksack with water in when it’s hot, and if you get a collapsible bowl you can attach it to the belt or tuck it inside depending on the style you go for. The one we have is from a shop in the UK – it cost £3 (thanks mum) and actually does what it says! 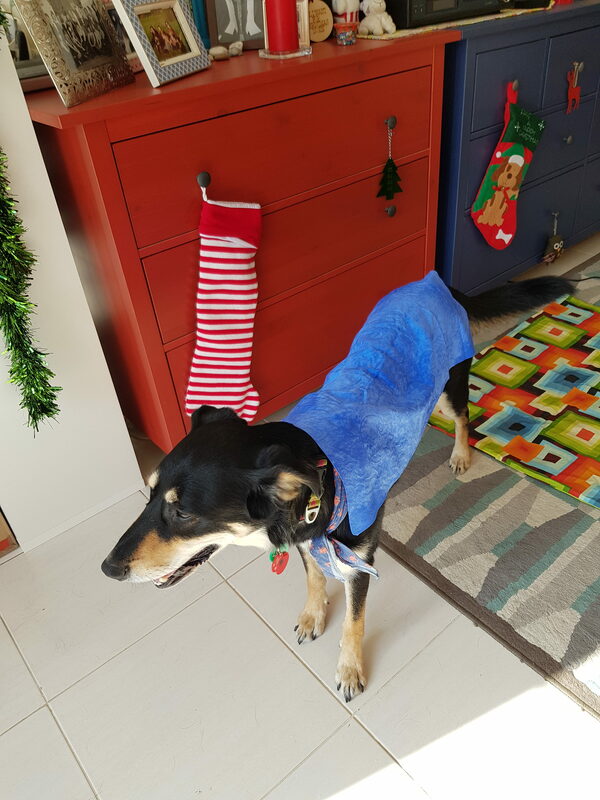 It’s a bit like a chamois leather – you have to keep it damp and keep it in the tube it came in, but it feels a lot colder to touch and doesn’t drip everywhere – perfect for when your dog is stretched out and warm, you can lay it over their tummy and chest to help them cool faster. 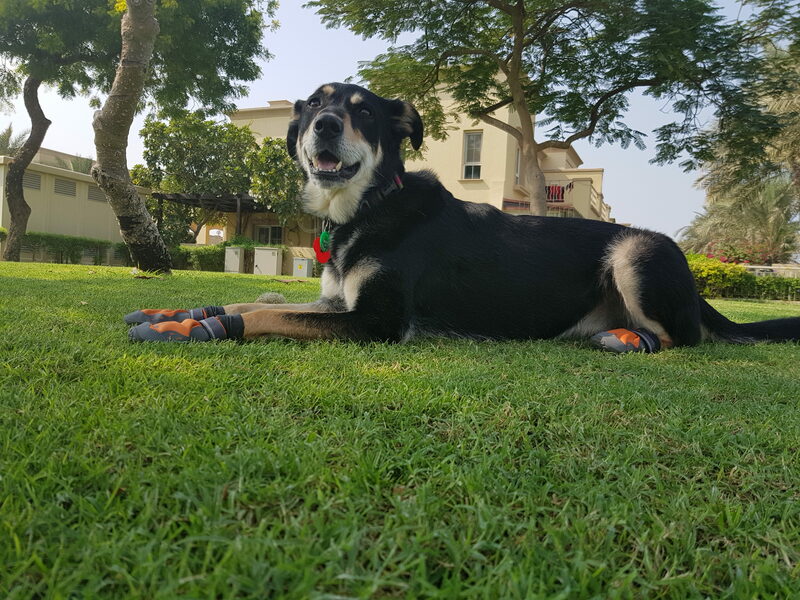 DubaiPetFood has a cooling ‘bandana’ from IZI which utilises similar technology to the towel and the gel mat. In the UK when it’s been warm (not Dubai warm!) Roxy has always worn a cloth bandana which we would soak to cool her down. I have a cheap Pets at Home version of the Furminator that I bought in the UK. It’s a great way to strip out the dead under hair from dogs with thick coats. I aim to brush Roxy every other week to ensure I don’t irritate her skin (don’t press too hard, they can scratch so this should be used carefully). I don’t use it on Custard as her coat is very thin and it would just hurt her. If you use a groomer, make sure they don’t shave your dog if it has a double coat! Their coats have cooling properties of their own even if they do seem thick, and you will be making life more unbearable for them. You can get dog versions from Trixie, (just ensure they are supervised) as it’s much cheaper to buy one for little kids. Roxy hates them. I spent last summer trying to get her used to one, but she wasn’t impressed. I’m hoping the heat and Custard might make her change her mind! Kongs are great because they are durable, but there are plenty of other treat dispensers out there. My only suggestion is to make sure they have more than one hole, there have been instances of dogs getting their tongues stuck due to suction. There are a variety of different kinds in all the pet shops in Dubai. The added bonus of a Kong is that you can stick a rope in the end and tie it to the inside of a crate, or a tree to add an extra element of fun! Mashed banana, raw egg and grated carrot – mix together and pour in. Peanut butter (make sure it’s xylitol free) followed by treats/dry food. Chopped up apple, strawberry and blueberries. Wet food – Any wet food will freeze once stuffed in a Kong. Just remember to reduce your dog’s meals accordingly if you are feeding it separately to meal time. Dry food – Soak your dog’s dry food in water and then put in the Kong (I do it the other way round!). Again, remember to reduce your dog’s normal meals. And even more with a quick Google! 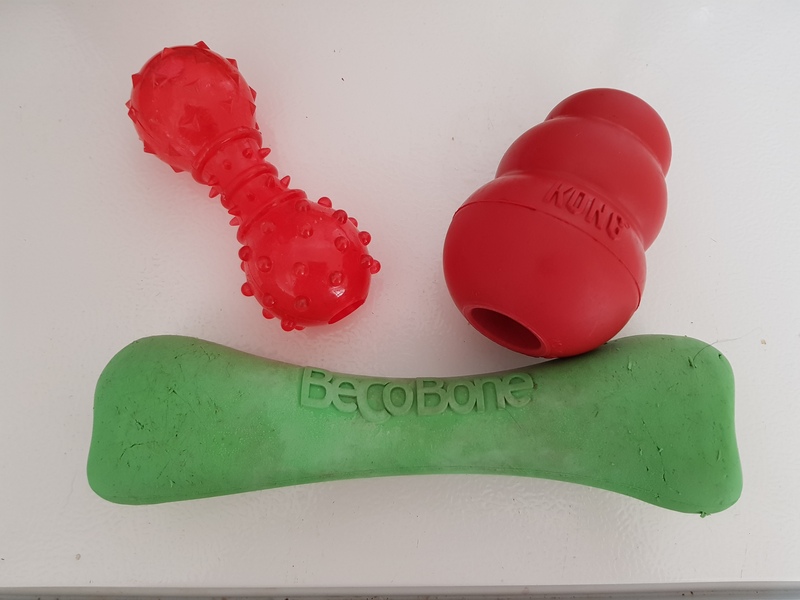 I like to stuff a dentastik/whimzee chew/ossebello treat into the middle of the Kong to make it last even longer – a bit like a giant lollypop! 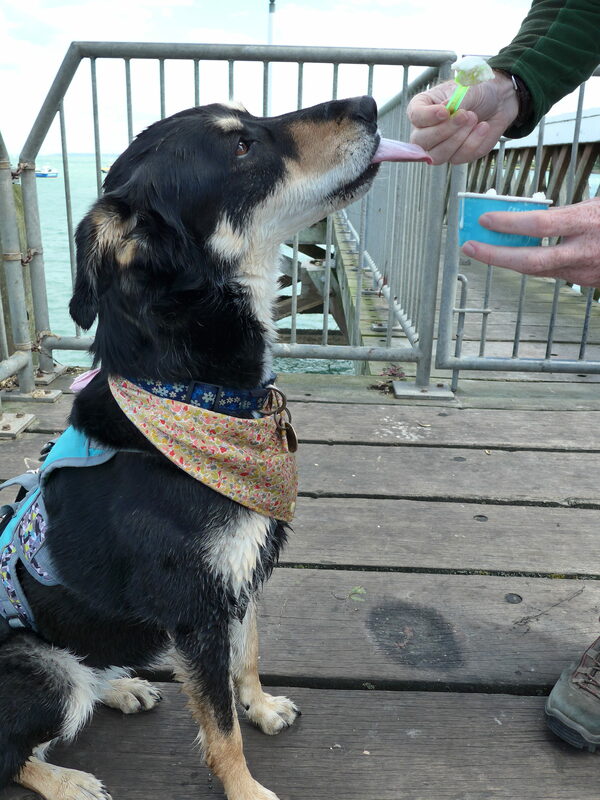 Hugo & Celine do a brilliant doggy ice cream which is now available in the UAE, or you can even make your own. You can also make recipes in ice cube trays with a drop of water for a quick pop out treat for your dog. You can use Kefir/Goat’s Milk to make ice cubes too. If you have any other tips for keeping your dog cool in the summer, please let me know – I’d be happy to try them out!